Authentic Frosts by Mora of Sweden are premium-grade knives and tools that are trusted by food professionals from around the world. 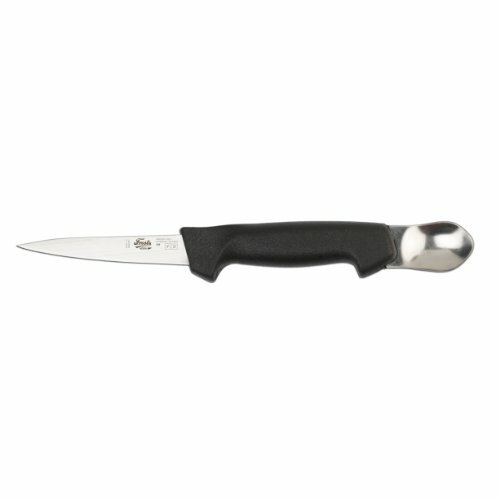 The Frosts 299P Fish Gutting Knife with Spoon is perfect partner to clean and gut your catch. The Swedish Sandvik 12C27 stainless steel blade resists corrosion and is cold-rolled for extreme sharpness and high-edge retention. The polypropylene handle is reinforced with glass fiber for increased friction and durability. A stainless steel spoon is conveniently positioned on the opposite end of the knife for gutting and cleaning fish. Medium flexibility blade. Stainless knife steel that can be sharpened to extreme sharpness and high edge retention.